At E&E Construction Company, providing value to our customers is our top priority. That’s why we offer leading-edge alternatives to commercial roof replacement whenever possible. 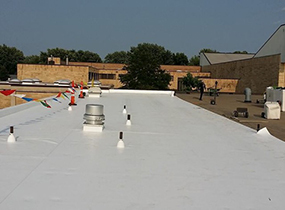 Replacing a roof is a huge expense and one that can often be postponed for many years with diligent maintenance and topnotch roofing solutions like roof coatings. However, there are times when replacing a roof is unavoidable. When that is the case and there are no viable alternatives to a commercial roof replacement, you can count on the crew at E&E Construction to install your new roof properly and expertly. 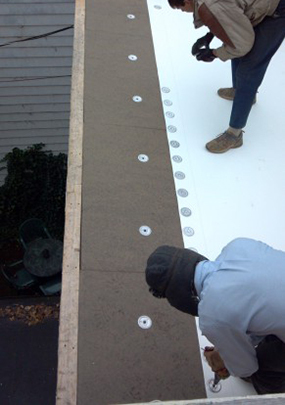 At E&E Construction, we are not only dedicated to providing our valued clients with top-quality workmanship, but we strive to make the roof replacement process as painless as possible. We also endeavor to keep the lines of communication open at all times and to keep our customers in the know throughout the replacement process. Inspection: One of our knowledgeable technicians will thoroughly inspect your roof to determine whether a total roof replacement is necessary or if an alternative solution can address your roofing problems. Consultation: Following the initial inspection, we will take the time to consult with you and discuss our findings along with our recommendations for the very best replacement solutions for your specific roof. We will also answer any and all questions you have so you are as informed as possible before any replacement work commences. Replacement: Once all matters relating to your roof replacement have been agreed upon, we will go to work. Our team members are trained to work quickly and efficiently to limit disruptions to your business as much as possible. Inspection:Once your new roof has been installed, our expert quality control manager will inspect the new roof to ensure every aspect of the work has been performed correctly. 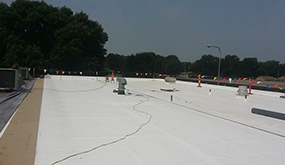 Maintenance:We can custom-tailor a maintenance program to protect your roofing investment once our work is finished, helping ensure your roof fulfills its life expectancy and that your building and its contents are well-protected for the long haul. 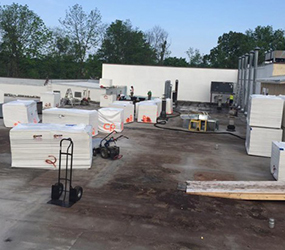 At E&E Construction, we have spent the past decade providing customers throughout Ohio, West Virginia, Kentucky and Indiana with the very best commercial roofing services, including roof replacement. We are dedicated to total customer satisfaction, and we combine our outstanding work ethic, affordable prices and exceptional workmanship with industry-leading Conklin roofing products. The result is an outstanding finished product that is made to stand the test of time. Give us a call today at (740) 331-0695 for all of your roofing needs. We will provide you with the very best workmanship and customer service so you can relax and know your roof is in the hands of capable experts!